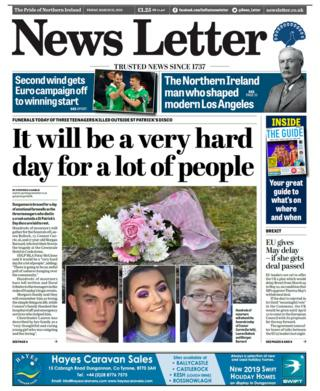 Both the News Letter and Irish News lead with the funerals of the three County Tyrone teenagers who lost their lives in a crush at a hotel in Cookstown on St Patrick's Day. Lauren Bullock, 17, Morgan Barnard, 17, and Connor Currie, 16, are to be buried today. The Irish News says the entire community in Dungannon is united in grief. The News Letter reports that the town is "braced for a day of emotional farewells". The lead story in the Belfast Telegraph is about an electrical firm in Lurgan being fined £50,000 following the death of an employee. Jonathan Peden, 33, died after machinery fell on him in August 2016, just weeks after getting married. The company, Alan Little Ltd, admitted two health and safety charges in relation to the incident. Turning to politics, the News Letter's editorial focuses on the Northern Ireland Secretary, Karen Bradley. Ms Bradley has been criticised over her performance as secretary of state but the News Letter holds that that is "disproportionate". "The secretary is to blame" for the failure to restore devolution, "but not for the reasons that critics mostly cite", it says. Ms Bradley and the government have shown "weakness in the face of Sinn Fein tactics", it continues, accusing Sinn Féin of abusing the system of mandatory government. The paper states that Ms Bradley "should long ago have brought back rule by ministers, scrutinised by MLAs". Ms Bradley extended the period that Northern Ireland can go without a government earlier this week. The shadow secretary of state, Tony Lloyd, challenged Ms Bradley on the deadlock, the Irish News reports. The NI secretary had to be a "figure of trust and authority," Mr Lloyd said. The Belfast Telegraph carries comments from UUP peer Lord Empey. The former UUP leader accused the government of "recklessly endangering people's lives" in its approach to ending the Stormont stalement. The Daily Mirror is covering footballer Declan Rice's apology after "writing pro-IRA messages on social media". The midfielder wrote the message on Instagram three years ago when he was a Republic of Ireland youth player. He has since transferred to England.